DeSoto was introduced as a new marque by Walter Chrysler for the 1929 model year and in 1933 Chrysler took it upmarket. In 1955 they introduced the Fireflite as their top-level car. For 1956 the cars were mostly carried over, but the introduction of the Adventurer put the Fireflite as the mid-level car in DeSoto’s lineup. For 1956 the Fireflite could be had in four different body styles (plus a limited package on the convertible to commemorate the car’s use as the Indy 500 Pace car in 1956). A non-Pacesetter Convertible would’ve run you $3,454 in 1956 and 1,485 were built (pace cars included). Power came from a 255 horsepower, 5.4-liter V-8. A no expense spared frame-off restoration was performed and the car wears two-tone Shell Pink and Charcoal. It looks like ice cream on wheels. DeSoto Convertibles always bring big money at Barrett-Jackson auctions, but most of those are ’57 or ’58 cars. It’ll be interesting to see if this beautiful car brings as much. It is coming from the famous John Staluppi Cars of Dreams Collection. You can read more here and see more from this sale here. 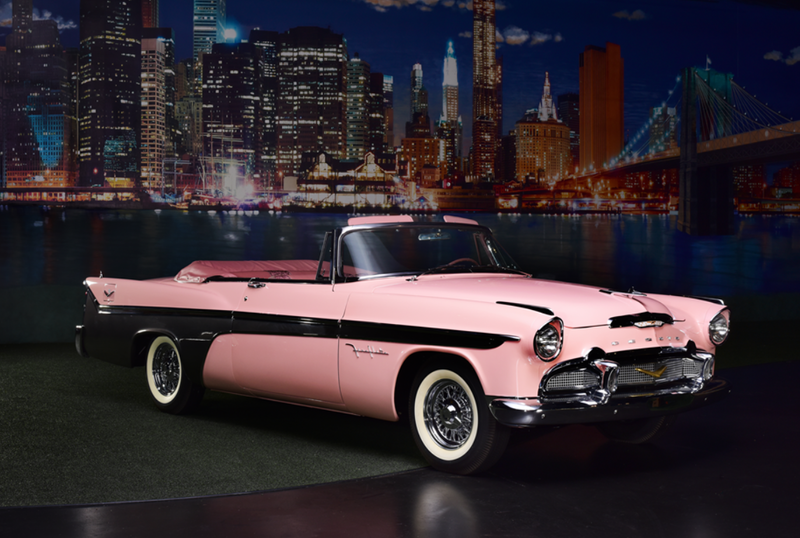 This entry was posted in Uncategorized and tagged 1956, auctions, barrett-jackson, cars, classic cars, convertible, desoto, fireflite by classiccarweekly. Bookmark the permalink.